Why would you want to limit an amplifier? Amplifiers are electronic devices that increase the power of a signal. The amount of amplification in an amplifier is measured by its gain, or the ratio of output voltage, current, or power to the input with a power gain greater than one. An RF amplifier is similar to an audio amplifier but with components suitable for RF frequencies. Because of the higher frequencies involved in RF amplification, the impedance levels of RF amplifiers are generally much lower than for audio amplifiers. Frequencies for RF amplifiers range between 20 kHz and 300 GHz and are usually coupled with an input or output impedance that is matched to the transmission line impedance or ratios of voltage to current. Often 50 Ohms and 75 Ohms are common impedance values for RF ports, and so RF amplifiers are usually specified as providing a given output power level at these impedances. Although RF amplifiers can be characterized as amplifying voltage or current, they are, technically speaking, amplifying power. The ideal amplifier would be a linear device, though real amplifiers are only linear within limits. Linear systems, when given a sufficiently strong input signal, will reach a point where the system departs from a linear relationship between input and output. At this point, the system is said to be going into compression or beginning to saturate. Beyond this point, the linear relationship between input and output is no longer valid and the amplifier is no longer considered to be linear, or is at the point of –1dB departure from linearity. The output power of an amplifier cannot increase indefinitely and, when an increase in input power generates no discernible increase in output power, the amplifier is said to be saturated, and the output is no longer proportional to the input signal. This value is often referred to as Psat on a datasheet. An amplifier increases the power of both the signal and the noise present at its input. Large amplification requirements can make a circuit susceptible to noise, distortion, and other non-linear effects. Spurious signal products are non-signal related and may be caused by a low level instability in the amplifier or introduced into the amplifier from external sources via the power supply, radiated interference, or other sources of intermodulation. When the signal drive to an amplifier is increased, the output also increases until a point is reached where some part of the amplifier becomes saturated and cannot produce any more output, which results in distortion. A low-noise amplifier (LNA) amplifies a very low-power signal without significantly degrading its signal-to-noise ratio and are designed to minimize additional noise. LNAs are found in communications systems, medical instruments, and electronic equipment. LNAs are designed for low noise figure and are very small devices which cannot tolerate handle high input power. Although LNAs are manage low frequency signal slightly above the noise floor, they must also mitigate the presence of larger signals that cause intermodulation distortion. The RF limiter is used to protect a LNA in a receiver chain. For example, where the input power is within the limits of the LNA, the limiter, positioned before the LNA, is in a low loss state whereby it passes the RF signal to the input of the LNA with marginal insertion loss. When a more powerful, possibly damaging, signal incident occurs at the input of the LNA, the limiter attenuates the signal level to ensure that the LNA or other components in the chain are not damaged. Specifically in receiver circuits, though often in other portions of an RF/microwave circuit, there are limits to the amount of power the circuit elements can handle. Often, electronic warfare (EW), signal intelligence (SIGINT), radar, and wireless communication systems that are interference limited have highly sensitive receivers that are susceptible to desensitization and damage from excessive signal power. 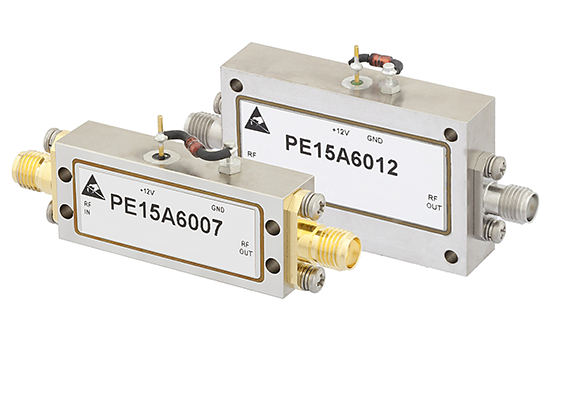 In the environments these receivers are deployed, they are also prone to exposure to interference, jamming, and environmental factors that could threaten the operation of the receiver. This is where a limiting amplifier is able to ensure that the total signal power of a specified frequency range remains below a desired threshold regardless of the input signal power. Though there are several different typologies, the two main types of limiting amplifiers either shunt excessive signal energy away from the sensitive circuitry, or rely on successive gain compression stages to deliver a consistent level of output signal energy. As with the introduction of any additional element in a signal chain, the linearity and frequency performance of a limiting amplifier are key when selecting such an amplifier for an application.